Paleochora Art Week is excited to announce that on the 3rd of September the greatest gallery in Crete opens its doors for the fourth year. Bringing art to the people. 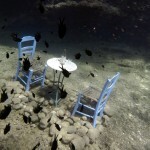 One of the largest collective art exhibitions in Greece. Starting with a great opening party at 7:30 pm the 3rd of September in the Town Hall of Paleochora. 40 artists from around the world will take part, exhibiting their artwork up until 18th of September, in the Town Hall and in the 23 Art Points of Paleochora, in the bars, cafes, taverns, hotels and at the beaches around the village.This year there is again a tombola. Anyone purchasing a ticket has an opportunity to win a piece of art from one of the artist. The lottery will be drawn at the Closing Party at 18th of Sept.
Paleochora Art Week started four years ago and lasted for one week, so hence the name, however at the end of this week, people asked for a longer time to see all the paintings, photographs and sculptures. 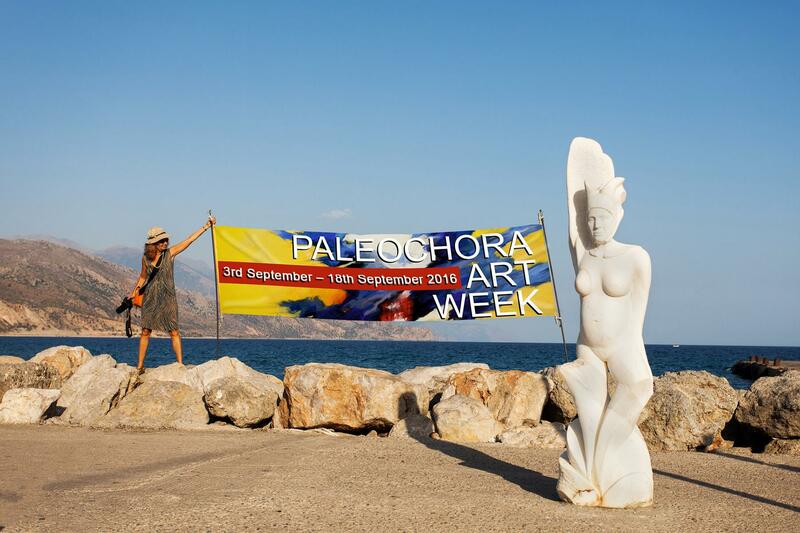 Now the Paleochora Art Week is a 16 day event with extra attractions. The greatest attraction is the Underwater exhibition at Methexis Beach. This is the second year that visitors can snorkel in the sea and view the exhibition. This year, 13 artists will display a dazzling array of paintings, photographs, sculptures and other things, there were not expecting. Look at the documentation film from last year on youtube. And for people, coming this year. and who like it more dry, could see a film in the Town Hall. Art Week offers a program with exciting events: underwater music, Art for Kids, Artist at Work and guided Art Walks. Who likes to get into a conversation with an artist, should visit one of our Artist at Work events. There you can watch how the artists create their paintings or sculpture. Three painters and one sculptor will work and explain how they use material or techniques. Look at the program and don’t hesitate to speak with the artists. For visitors who want to know more about artists, the art exhibited and Art Week should look at the program for the guided Art Walks in different languages. Who want’s to shake a leg has different possibilities:at the Art Week Party (7.9. ), at the Dance Marathon (10.9.) or during a creative dance workshop (11.9.). Who likes it more easy can have a look at Buthoh Dance (17.9.). The Paleochora Art Week is a non-profit organization, organized by a few artists and financed with the money of the artists and by the support of local sponsors. With complimentary admission to the Town Hall and all Art Points. More information you will find at the webpage www.paleochora-art-week.com or at Facebook. „Thousand’s of visitors, 40 artists from around the world, 20 Art Points, 1 town“ so starts the brand new film of the Paleochora Art Week. 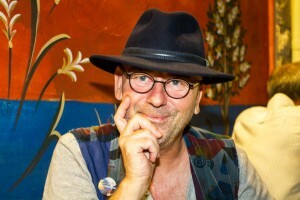 The filmmaker and artist Piet Freitag, who lives in Plakias, documents in this film the happenings of Paleochora Art Week 2015. 16 days of art, which includes streetpainting, art walks, art for kids, live music … And an Underwater Art Exhibition with paintings, photographs, sculptures, and an instalation of an underwater kafenion or a huge mandala, all under water. Only the underwater music, which was also one highlight, you can’t hear in this film. This documentary shows how Paleochora became a great Art Gallery for 16 days with a central display point in the Town Hall and 40 artists with a lot of amazing artwork.The film gives an image of Paleochora these days. Highlighting the programmed events as the opening, the tombola and Astrini Night. Giving you a glimps of the working artists and the different Art Points, which are the tavernas, hotels, cafe bars or the beaches of Paleochora. Live music and art workshops. The Paleochora Art Week is a special event which takes part every year in the beginning of September. This year from 3rd until 18th of September 2016. Paleochora Art Week is organized by artists for artists and is a non profit event. The Art Week wants to bring art to the people, connect artists and show how colorful the “art scene” is in and around Paleochora. All artists, who wants to take part can apply until 30th of April. More information www.paleochora-art-week.com. If you have missed the Paleochora Art Week last year, so have a look at the film and you will get the atmosphere of the Paleochora Art Week. And who wants to see more art under water can see it in a separate film. A photogallery you can find at the webpage. About 400 people were last Saturday at the Town Hall in Paleochora visiting the opening party of the Paleochora Art Week 2015. The visitors were excited by the quality of the artwork. What is the Paleochora Art Week? In the Art Week 40 Artists display their artwork at 20 Art Points, which means in tavernas, hotels, bars and at the beaches of Paleochora. 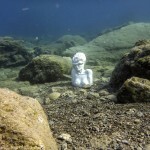 And the big surprise for all is for the very first time there is an underwater exhibition at Art Point Methexis Beach. If this was not enough there is also music in the sea. 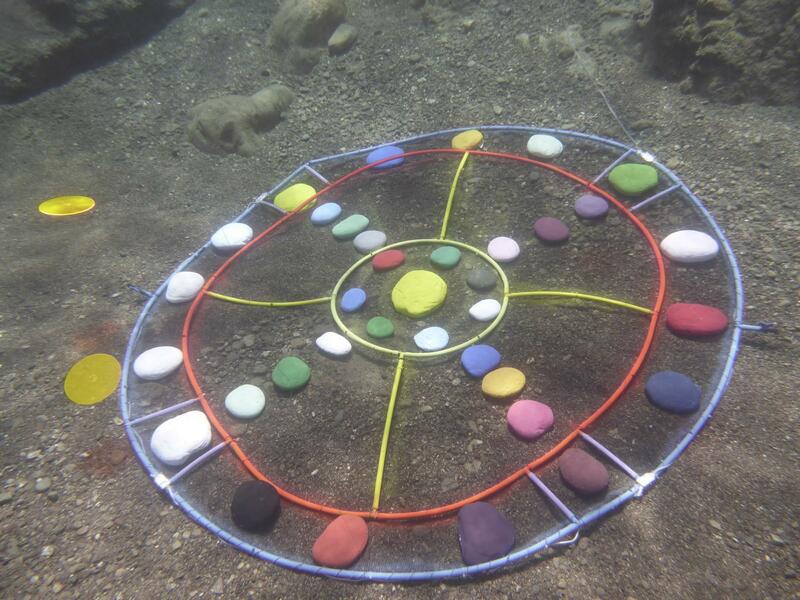 Between 5 and 7 pm Hans Mannooh, who has made the colourful mandala also plays music under water. For this he has built underwater loudspeakers. And for people who don’t like to snorkel they can see films of the underwater exhibition in the Town Hall. “The film is like a piece of artwork. I haven’t seen a film like this before. The film shows wonderful colours of the sea and the amazing artworks. It is very exciting”, said a visitor coming from Leeds. And on Saturday the 12th and 19th there will be an event, where people are invited to come with floating clothes or costumes and take part in a floating happening beneath the horizon. It will be filmed and later you can see the film in the Town Hall. 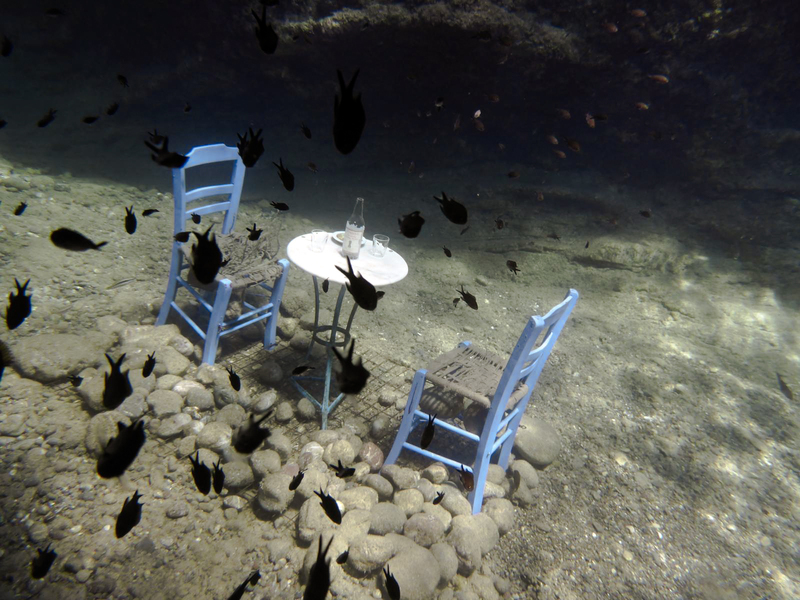 The artwork of the underwater exhibition is made by Gerhard Stelzhammer, Efi Fiotaki, Elena Strubakis, Hans Mannooh, Kostas Liatakis, Silvia Forrer, Smaragda Smaragdi, Sofia Markoulakis and Vasilis Patsourakis. More information you will find at webpage www.paleochora-art-week.com or on Facebook. The greatest gallery on Crete opens their doors on the 5th of September with a great opening party at 7:30 pm in Paleochora’s Town Hall. Attending the Paleochora Art Week are 40 artists, displaying their artwork in several disciplines up to the 20th of September: Painting, Photography and Sculpture. “We want to bring art to the people and so we have 20 Art Points around Paleochora. So visitors can go around the town and see artwork in different Art Points, such as tavernas, bars, hotels or at the wonderful beaches of Paleochora”, so says Efi Fiotaki, painter and one of the organisers of the Art Week. “It is like a paper chase for art and you can explore different places and see a lot of artists from 10 different countries. Most of them are living on Crete, coming from Paleochora, Plakias or Chania”, explains Gail Warham, painter and organiser. The central display point, where all artists have up to five pieces, is the Town Hall on the Main Street. The Town Hall is open every evening from 7 to 11:30 pm and this year for the first time on Sunday mornings from 11 am – 1 pm. Also for the first time there is an Underwater Exhibition at Methexis Beach. “You can go with a mask and snorkel and explore sculptures, paintings and much more that you will not expect to find there”, explains Gerhard Stelzhammer, sculptor and another organiser. 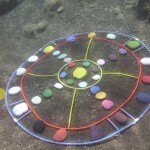 “For example a medicine wheel, underwater music and an underwater kafenion”. Every day from 5 – 7 pm there are events with underwater music and more. And for people who don’t like to snorkel they can see photos of the underwater exhibition in the Town Hall. The program this year offers other exciting events: art for children, artists at work, guided art walks and workshops in painting and photography and also music. Like last year there will be a tombola and the Astrini Night. For the tombola everybody can buy a ticket for 2 Euro with a chance of winning a piece of artwork from one of the artists. The lottery will be drawn on 20th of September at the Closing Party. “At the Astrini Night local music and dance will await you. 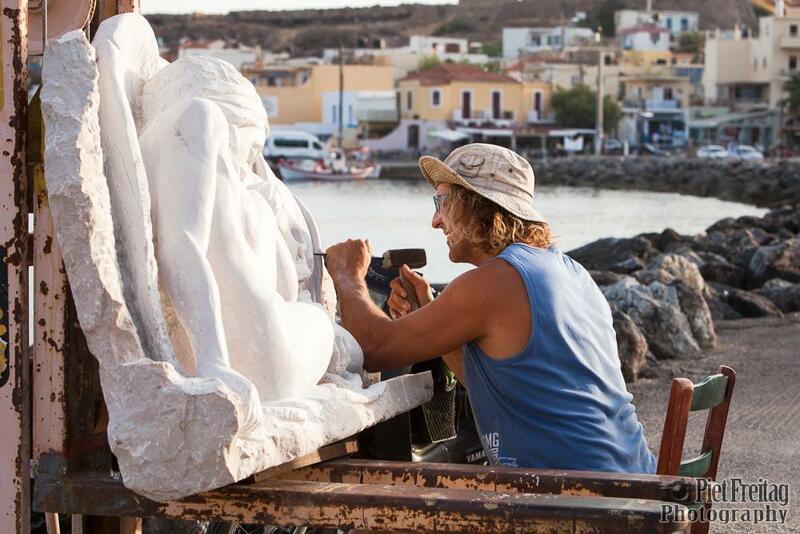 You are invited to come on the 11th September to the statue of Astrini on the sandy Beach”, so says Efi Fiotaki. ‘Artists at Work’ means that you can look over the shoulder of an artist. “So you can see how they work or you can ask whatever you want to know”, explains Gail Wareham. One of these artists is Zoran Kocev and he will paint with other artists of the Art Week on the foot path of the Stony Boulevard. So at least the stony Boulevard gets some colour!. Zoran starts on 6th September and every day you can see him or other artists of the Art Week painting the Boulevard from 5 – 8 pm. The Paleochora Art Week is a non-profit organisation, organised by a few artists and financed with the money of the artists and by the support of local sponsors. More information you will find at the new webpage www.paleochora-art-week.com or on Facebook.